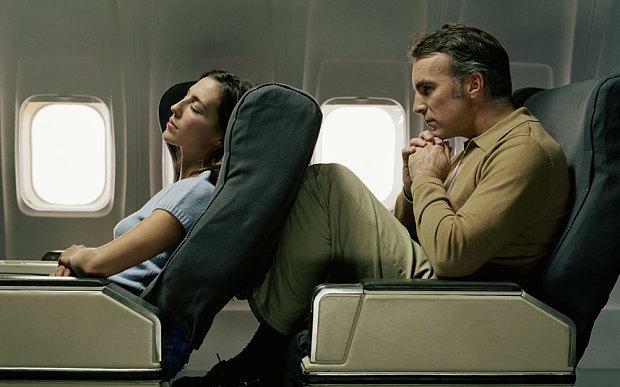 Is reclining your seat an abomination that must be eradicated, or a basic human right? 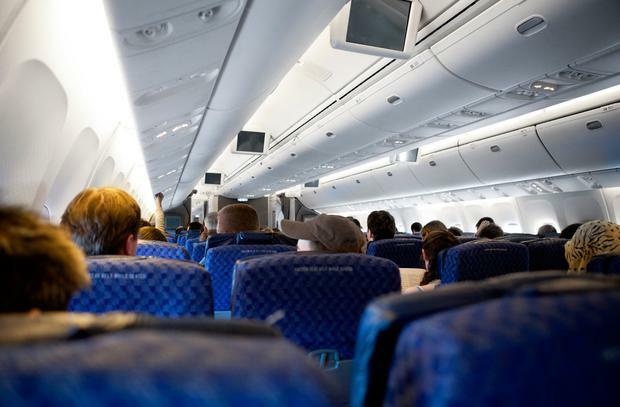 The fact that this is even a subject for argument came as rather a shock to me, when, not long ago en route to New York, I overheard a fellow passenger grumble about the person sitting in front of them reclining their seat. Briefly puzzled, I stored it away merely as one of those peculiar observations and continued to enjoy my flight, fully reclined. A few months later it came up again. Someone at the office made a remark about it being “rude to recline”. This was concerning. Had I been flying my whole life in a way that had offended and disrupted potentially thousands of other passengers, without even a second thought? Not only do I keep my seat reclined on every flight, in every situation, with the sole exception of meal times, but I slyly push that button – ever so gently – as soon as the plane takes off so that it tilts back with the force of the ascent, rather than wait until we’ve reached altitude, in a motion which feels less abrupt. Again, until now, this to me was just common sense and in fairness, not once have I ever been called out on it. So I asked around and sure enough, a quite astonishing number of people said very matter-of-factly that yes, of course it’s a faux pas to recline one’s plane seat for the entire duration of a flight (if at all), and what sort of animal was I to think otherwise? 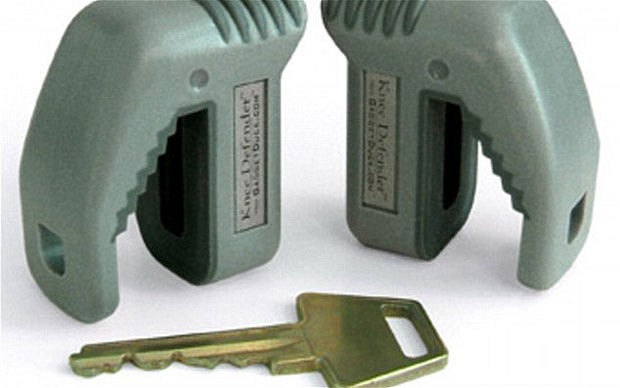 There’s even a device you can buy, the Knee Defender (below) which attaches to your tray table and prevents the person in front from reclining. Surely it is the meekest, most passive-aggressive invention ever made. And I’m not alone. In 2014, the sneaky use of this gizmo on a flight from Newark to Denver prompted a conflict so furious, the pilot was forced to make an emergency landing in Chicago. In the face of overwhelming public opinion, I have two options at this point. Either take this new information on board (literally) and resolve never again to lean back in such a cavalier fashion, for the good of the passenger behind me, or dig my heels in and fight. I choose to fight. I, along with plenty of others. Author and flight attendant Heather Poole, who penned the memoir Cruising Attitude: Tales of Crashpads, Crew Drama, and Crazy Passengers at 35,000 Feet, claims she breaks up more mid-air frays over this matter than any other. Etiquette expert William Hansen, backs her up, telling me that passengers should “always” check in with the person behind before reclining, even if just with “eye contact and a smile”. I understand, as I delve further into this heated topic, that there are nuances to these rules. Apparently it’s OK to recline on a long-haul flight when the lights dim and it’s time for sleep. But on a short-haul flight? Perish the thought. And, as Hansen suggests, if you do wish to recline, it’s only polite to swivel round first and ask the person behind you if they wouldn’t mind. Ludicrous, all of it. Being tall is an advantage in some situations (reaching things, attracting a mate) and a disadvantage in others (public transport, shopping for jeans). The average height of a man in the UK or Ireland is 5ft 9in, a woman is 5ft 3in. If you happen to be taller, this is not your fault, but equally it is not my problem, not on a plane where all the seats are the same size. Most aircraft seats have a recline function. It’s not for safety, it’s for comfort, and it’s the right of every passenger who has purchased a seat, and the recline button with it, to use it. What sort of self-flagellating martyr sits like a plank for hours on end, ignoring the only button at their fingertips which provides respite, in fear of annoying a stranger? Why is their comfort any more important than mine? If everyone in the economy cabin held such a puritanical attitude, you’d have rows and rows of people sitting like planks for the entirety of a flight. If, on the other hand, the recline function was automatic, and kicked in shortly after take-off, you’d have rows and rows of people sitting more comfortably, and no-one with diminished space. It all comes down to indisputable science. The passenger who reclines is only cutting into the space of the person behind them if this person doesn’t also recline. So if you’re the sort of person who tuts when the seat in front lurches into your sphere, but refuses to follow suit and make like a domino, you are the one putting a spanner in the works. Would you rather be a spanner or a domino? The choice is yours, but spanners have no cause for complaint when the solution is in front of them. Still think it’s rude to recline? You’re in luck. Many budget carriers these days have seats that don’t even have the function – and not to settle any sort of debate when it comes to comfort, it should be noted (these are the same carriers which tend to pack in more passengers, with less legroom) but because they’re cheaper to install and maintain. Earlier this year, British Airways joined the likes of Ryanair and Norwegian (as well as several low-cost carriers in the US, Spirit and Allegiant Air included) in announcing than 35 of its next-generation Airbus A320neos and A321neos, serving flights of up to four hours, will have seats that don’t adjust. Crucially, however, these seats will be “pre-set to a gentle recline” position, which brings me right back to my aforementioned suggestion that for the system to work, every seat should be bent back slightly, and no-one should be expected to sit like a plank. Am I going to alter my behaviour in the new knowledge that reclining my seat is more than likely irritating the passenger behind me? No. There are lots of irritating things about flying and at the end of the day, it’s every man for himself. Will I at least start asking if it’s OK before I recline? Certainly not. I refuse to seek anyone else’s permission to press my own button. Pól Ó Conghaile Holidays are about switching off, but they can also be a surprisingly good time to make and break habits. Sally Peck The first time I went to Center Parcs, I told my children we were off to spend a weekend in the forest. Being fans of Winnie the Pooh, they were excited.